SEPTA officials look over the damaged train cars at the 69th Street Transportation Center. Federal investigators began a review of a crash Tuesday on the Norristown High Speed Line, a process that will likely take up to a year before a final cause is released. A one-car train carrying 41 people and an operator struck a parked, empty train car at the 69th Street Transportation Center about 12:15 a.m. Tuesday. Thirty-two of those on board, including the operator, were injured, the National Transportation Safety Board reported. None of the injuries appeared to be life-threatening, SEPTA said, but police said at least two people had serious injuries. The operator was taken to a trauma center at Penn Presbyterian Medical Center, said Upper Darby Police Capt. Thomas Johnson Jr., though he has been released. A woman suffered serious facial injuries, he said. The NTSB's eight-person team will review video from the cars, conduct interviews with the dispatcher and operator, and review the vehicles and SEPTA's safety systems in the course of the investigation, said Ruben Payan, the NTSB's lead investigator. He expected the team would work in Philadelphia up to five days before returning to Washington to review data collected. The cars involved did not look too badly damaged from the outside, Payan said, but there was floor buckling inside them. His staff will do an in-depth inspection of the vehicles' interiors in the coming days. There was nothing unusual in an out-of-service train car being parked at the stop, he said. The cause of the crash remained unclear, and Payan would not speculate how fast the moving car was traveling. The Norristown High Speed Line is equipped with Automatic Train Protection, Payan said, a signal system that monitors a train's speed and includes some automatic braking functions. How that system was working, and if it should have prevented the accident, will be part of the NTSB review, he said. U.S. Rep. Robert Brady (D., Pa.) called for an expedited investigation. "It's been six months since a train on SEPTA's Market-Frankford Line derailed when it crashed into a stopped train. And that investigation is still going on," he said. "Are we supposed to wait another six months to find out what led to this latest crash? We need answers now, so the problems can be corrected and the riding public is safe." When the call came in about the crash, Upper Darby emergency officials mobilized for a mass casualty incident and responded with about 20 ambulances. The injured were taken to eight hospitals. SEPTA officials look over damaged train cars at the 69th Street Transportation Center. The train operator, who was not identified Tuesday, is a member of United Transportation Union Local 1594. Waverly Harris, the local's president, said he did not have enough information to comment on the crash Tuesday morning. The operator was blood-screened for alcohol and narcotics at the hospital, Payan said, and investigators were awaiting results. Norristown Hgh Speed Line trains operate along 22 stops between Norristown and Upper Darby. The 13.4-mile line moves about 11,000 people each workday between 69th Street and Norristown, according to SEPTA route statistics. The 26 cars on the route's fleet were built from 1993 to 1994, SEPTA reported. The cars are required to undergo a safety inspection every two weeks, said Joe Coccio, secretary-treasurer for Transportation Workers Union Local 234, which represents workers who handle maintenance on the High Speed Line cars. That inspection would include a check of the brakes, he said. The cars also undergo regular maintenance. A man who said he was a passenger on the train and identified himself only as Ronnie from Havertown told YC News and other reporters at the scene that the train overshot two earlier stops, at the Gulph Mills and Bryn Mawr stations, and had to back up. After the crash, at least one rider voiced apprehension about riding on the line. "Scared. Just a little bit," said Tyeisha Bagwell, 27, of Frankford. "Because I got to take this train every day." For many riders, though, the crash was noteworthy primarily for the inconvenience it caused. "Now I'm going to be late because I missed my train," said Samaad Brooks, 23, of South Philadelphia, who works at American Medical Depot in King of Prussia. "Today I have to be there at 10 o'clock. That's not happening." 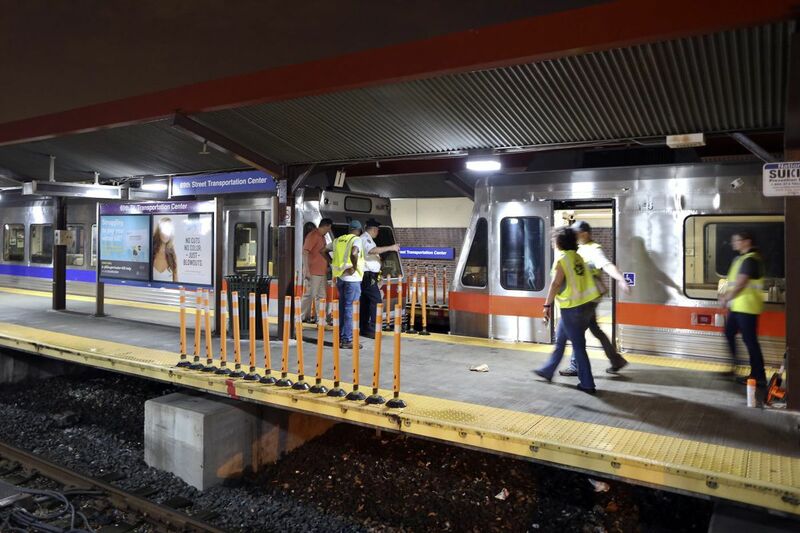 The High Speed Line's braking system is similar to that on the Market-Frankford and Broad Street lines, a SEPTA spokesman said. The automatic signal system controls speeds less precisely than the more advanced Positive Train Control, which would have prevented the 2015 Amtrak derailment in Philadelphia and which is now in place on Amtrak's Northeast Corridor and many of SEPTA's Regional Rail routes. PTC is federally mandated for certain classes of passenger rail, but not the Norristown High Speed Line or the city's two subway lines. Still, an automatic train control system should be sufficient to keep travelers safe, said Matt Mitchell, vice president of the Delaware Valley Association of Rail Passengers. It was possible, he said, that both mechanical problems and human error could have played a role. "Even if it was some kind of mechanical error, you would expect the operator would have recognized there was some kind of malfunction and would not have gone any further if the brakes were not working," he said. The crash Brady referred to was at the 69th Street center in February. In that incident, a Market-Frankford Line train derailed in a rail yard when it crashed into a stopped train, seriously injuring one of the operators. The train's operator has retired, according to a union representative. The NTSB also is still looking into a crash of two trolleys in January in the Powelton section of West Philadelphia. The accident, in which a Route 10 trolley rear-ended another Route 10 vehicle, injured 46 people. More than three decades ago, the 69th Street center was the site of a crash on the Norristown High Speed Line similar to Tuesday's incident. On Aug. 23, 1986, a car on the line careered into the terminal, injuring 44, including a man who eventually died. In that case, the NTSB found the operator was attempting to brake the train while the throttle was still on. The incident led to SEPTA's shutting down the line for almost two months. In that era, the Norristown High Speed Line was plagued by troubles, with a car catching on fire in 1979 and a serious derailment in January 1987. Since then, though, its cars have proven to be among the most reliable modes of travel for SEPTA. "The Norristown line is really a hidden gem of the SEPTA system," Mitchell said. "Not many people know about it, but those who know it know it's a very fast and frequent ride." Staff writers David Lee Preston, William Bender, and Erin McCarthy contributed to this article.